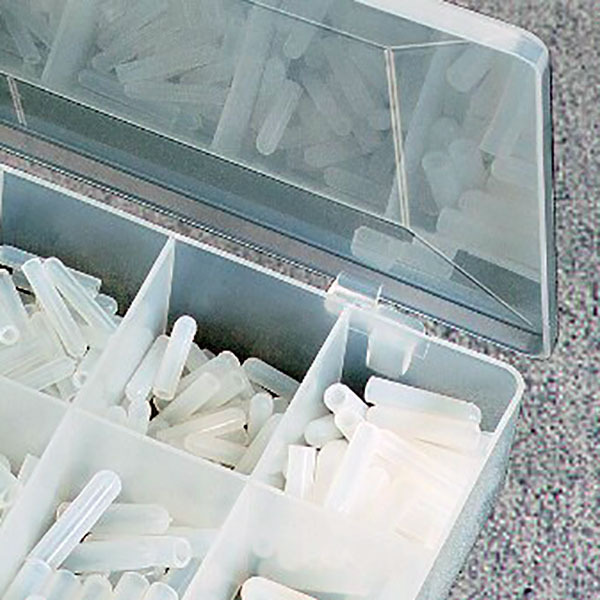 Our starter kits contain a variety of caps and plugs in different sizes. Please compare the kit listing with the product page. This kit contains small amounts of BES sizes 0070X1000, 0080X0750, 0093X0750, 0100X1000, 0109X0750, 0125X1000, 0140X1000, 0148X1000, 0156X1000, 0172X0500, 0172X1000, 0187X0500, 0187X1000, 0197X0500, 0218X1000, 0223X1000, 0234X1000, 0250X1000. This kit contains small amounts of BTM sizes 0208, 0218, 0278, 0283, 0336, 0358, 0392, 0426, 0451, 0583 and 0728. This sample kit contains small amounts of EC products in these sizes: 0295X0500, 0295X1000, 0312X000, 0312X1500, 0340X1000, 0355X1500, 0375X1000, 0437X1000, 0456X1500, 0468X1000, 0480X1500, 0500X1500, 0535X1500, 0600X1500, 0625X1500, 0750X1500, 0812X1500, and 0875X1500. This kit contains small amounts of EPP products in these sizes: 0093X0625, 0105X1000, 0109X0625, 0125X0625, 0130X0625, 0140X0625, 0156X0625, 0162X0625, 0187X0625, 0218X1000, 0225X1000, 0275X1000, 0281X1000, 0312X1000, 0335X1000, 0350X0900, 0388X1000 and 0440X1000. This starter kit contains small amounts of the FLPE product line in these sizes: 00402, 00604, 00806, 01008, 01210, 01412, 01614, 01816, 02018, 02018, 02220, 022422, 02624 and 02826. This starter kit contains small amounts of the FLPS product line in these sizes: 00402-N, 00604-C, 00806-Y, 01008-F, 01210-U, 01412-C, 01614-Y, 01816-F, 02018-U, 02018-U, 02220-C, 02220-C, 02422-Y, 02422-Y, 02624-F, 02624-F and 02826-U. This starter kit contains small amounts of SC caps in various sizes: 0070X1000, 0080X0750, 0093X0750, 0100X1000, 0109X0750, 0125X1000, 0140X1000, 0148X1000, 0156X1000, 0172X0500, 0172X1000, 0187X0500, 0187X1000, 0197X0500, 0218X1000, 0223X1000, 0234X1000 and 0250X1000. This starter kit contains a small amount of SC caps in these sizes: 0281X1000, 0295X1000, 0312X1000, 0340X1000, 0355X1500, 0366X1500, 0375X1000, 0406X1000, 0437X1000, 0456X1500, 0500X1500, 0562X1500, 0600X1500, 0625X1500, 0687X1500, 0730X1500, 0875X1500 and 0937X1500. Starter kit for SOMS Product Line. This starter kit contains a small amount of SOMS (Sink-O-Mask) Plugs in various sizes: X2012-C, X3116-C, X4016-C, X4816-C, X5317-C, X4020-C, X6020-C, X6024-C, X6924-C, X4032-C, X6032-C, X6540-C, X7940-C, X7940-C and X7948-C.
Starter kit for SPP Product Line. This starter kit contains small amounts of the SPP product line in various sizes: 0073X0625, 0091X1000, 0093X0625, 0109X1000, 0118X1000, 0125X0625, 0130X1000, 0140X0625, 0154X0625, 0156X0625, 0158X1000, 0162X0625, 0175X1250, 0187X0625, 0190X1250, 0197X1000, 0218X1000 and 0225X1000. This starter kit contains small amounts of the SPP product line in these sizes: 0236X1250, 0257X1000, 0275X0950, 0281X1000, 0312X1000, 0332X1125, 0335X1000, 0350X0900, 0388X1000, 0400X1000, 0437X1250, 0440X1000, 0445X1000, 0468X1250, 0500X1000, 0530X1000, 0530X1000, 0612X1000 and 0640X1000. Starter kit for STS Product Line. This starter kit contains small amounts of STS stoppers in a variety of sizes: 0062X0625, 0078X1000, 0100X1000, 0125X0625, 0187X0625, 0197X1100, 0200X0750, 0216X1500, 0250X0750, 0250X1000, 0276X0787, 0315X0787, 0343X0625, 0343X1000, 0375X0500, 0375X0750, 0393X0787 and 0437X1000. This starter kit contains small amounts of STS stoppers in various sizes: 0472X0748, 0500X0813, 0500X1000, 0562X1125, 0563X1000, 0590X1000, 0625X0813, 0656X1000, 0687X1000, 0748X1000, 0787X1000, 0812X1000, 0938X1000, 1024X1000, 1063X1000, 1102X1000, 1220X118 and 1260x1000. Starter kit for TNM Product Line. This starter kit contains TNM (Thread-n-Mask) plugs in various sizes: 0082, 0100, 0106, 0120, 0131, 0156, 0171, 0186, 0212, 0270, 0335, 0400 and 0470. This sample kit contains small amounts of the WP product line in various sizes: 130-250-140, 130-250-200, 140-250-180, 155-250-238, 130-312-155, 155-312-238, 200-312-238, 200-312-275, 180-350-225, 200-375-275, 209-375-275, 275-375-375, 130-500-375, 155-500-390, 275-500-375, 375-500-455, 390-500-455 and 140-625-250. Starter kit for WPP Product Line. This starter kit contains small amounts of the WPP product line in various sizes: 0173-R, 0217-U, 0224-Y, 0283-L, 0331-O, 0346-N, 0413-G, 0439-P, 0490-W, 0518-Y, 0545-F and 0580-R.